The Maya Payment machine is like a big smartphone that can accept and dispense cash. Maya continues to build new profit generating apps for the kiosk. As of now, Maya Payment Machines have ATM functionality, International Money Transfer, Bill Pay, Mobile Top Up, and Gift cards. Soon Maya will have other apps, such as rent payments, check cashing, prison payments and more. 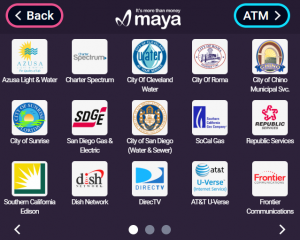 The possibilities of a Maya Payment machine are endless! The more useful services Maya adds to the kiosk, the more profitable the kiosk will become!